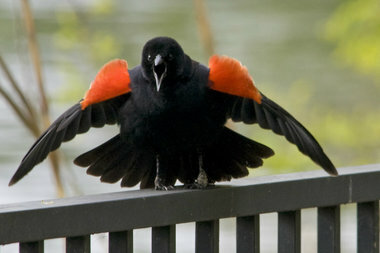 Red-winged blackbirds have a distinctive trill. LINCOLN PARK — What's that little bird actually trying to tell you? The author of a new field guide offers to "decode" bird chirps at the Notebaert Nature Museum Tuesday evening. Nathan Pieplow, author of the new "Peterson Field Guide to Bird Sounds of Eastern North America," speaks at 6:30 at the Notebaert, 2430 N. Cannon Drive, on the topic of "Bird Sounds Decoded." Pieplow, whose straight gig is teaching writing and rhetoric at the University of Colorado in Boulder, has developed a technique of visualizing and categorizing bird sounds. He also has a website called Earbirding on "recording, identifying and interpreting bird sounds." The book lists at $28, but it also has a companion website where birders can hear the trill of a red-winged blackbird (distinguished by states, no less) and the screech of a nighthawk, among the calls of many other bird species included in the 5,400 streaming audio files.